Kirby follows Mullen. Maybe we’ll get another sharp crack that day. I rate that as 100% TRUE. Sony Michel’s love letter to Dawgnation is a must read. 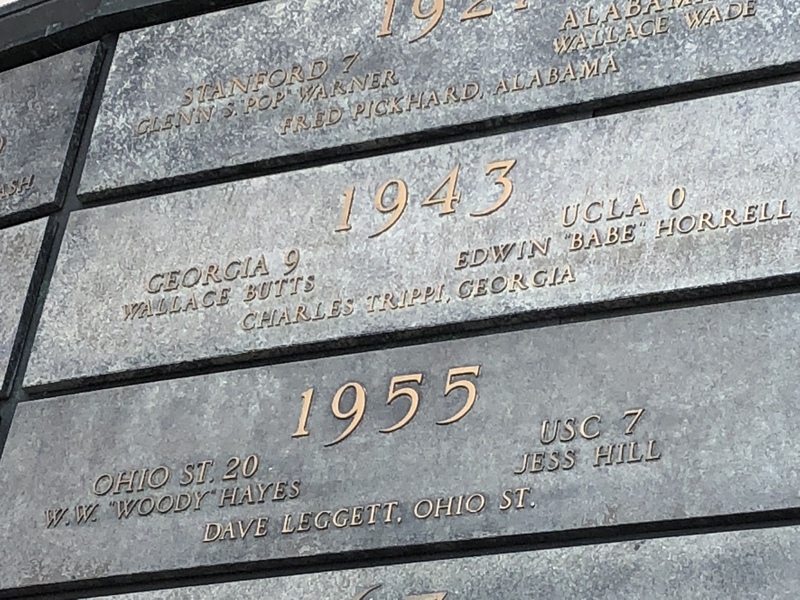 Walking to my seat before the game, I checked out the wall at the Rose Bowl’s Court of Champions commemorating the bowl game’s history, so it’s extremely cool to see the latest addition. It’s not a national championship trophy, but it’ll do until one comes along, I suppose. UPDATE: My buddy DC Weez sends this along. Interesting post here exploring the subject of how much of an advantage a bye week gives to P5 head coaches with four-plus years at their current post. Of the same 28 Power head coaches mentioned above, only 7 (or 25%) have a better record coming off a bye week than they do in conference play. It means that 75% of the most entrenched Power head coaches have a disadvantage, relative to their league record, after a week off. With regard to those seven, the author did find one statistical correlation. Though the seven exceptions appear to be as random as their counterparts with a disadvantage, they are bound by a common statistical thread – not one has a winning record at their current post against ranked opponents. Petersen is 7-10 vs. the Top 25 at Washington, Kelly is 14-17 at Notre Dame, Malzahn is 14-16 at Auburn, Cutcliffe is 5-20 at Duke, Whittingham is 12-21 at Utah, Kingsbury is 2-18 at Texas Tech and Doeren is 2-11 at NC State. The bigger the advantage a coach has coming off a bye, generally the lower his record is against the Top 25. Washington’s Petersen, who is 6.5% better after a week off than in Pac-12 play is 41.1% against Top 25 foes. Compare that to NC State’s Doeren who has a 22.5% advantage after a bye vs. a 15.4% record against ranked opponents.